We begin our relationship with you by exploring your needs. 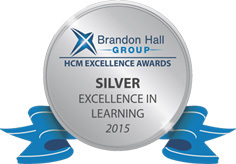 October 2015 - iQue Group, a leader in learning and talent development consulting, and Advantexe Learning Solutions, a global leader in business acumen, business leadership, and strategic business selling training solutions, announced that they have won a 2015 Brandon Hall Group Excellence in Learning Award in the category of Best Use of Games and Simulations in eLearning. Their winning entry was a Business Acumen for Drug Development learning journey developed for the Merck Research Labs (MRL) business unit of Merck. The Brandon Hall awards program is the most prestigious of its kind in the learning and development industry. Through a computer-based business simulation, Business Acumen for Drug Development helps Merck R&D leaders develop the skills needed to make better functional business decisions that align with Merck’s overall strategy and allocate resources for maximum ROI. Participants completed a series of eLearning modules on business acumen topics then worked in teams in the classroom to run a simulated pharmaceutical company, competing for sales and market share in a global marketplace. “Brandon Hall recognizes organizations that develop and deploy well-designed, strategically-driven programs that achieve strong results,” said Mary Cauffman, partner, iQue Group. “This award-winning learning journey is helping Merck R&D leaders enhance the business acumen skills that prepare them for the new reality of how resources, investments and people must be allocated in the most prudent and responsible way.” Within 3-4 weeks of completion, participants reported applying their new knowledge and skills and identified millions of dollars in cost impact from actions they have planned as a result. iQue Group is a unique consulting firm offering services in two interrelated practice areas: learning and talent development. iQue Group’s core capabilities enable the delivery of solutions that are holistic, integrated and comprehensive, leveraging an unrivaled network of consultants whose expertise is matched to each engagement. Advantexe Learning Solutions is a global professional organization that provides broad-based business acumen, business leadership, and strategic business selling training and consulting solutions that are relevant and challenging, and that positively impact business performance. iQue Group, a leader in learning and talent development consulting, and Advantexe Learning Solutions, a global leader in business acumen, business leadership, and strategic business selling training solutions, announced that they have won a 2014 Brandon Hall Group Excellence in Learning Award in the category of Best Use of Games and Simulations in eLearning. Their winning entry was a healthcare marketplace simulation developed for the Managed Markets group at AstraZeneca. The Brandon Hall awards program is the most prestigious of its kind in the learning and development industry. “AstraZeneca enlisted the services of iQue Group and Advantexe to teach Sales and Marketing Leaders how to use and analyze managed markets data effectively to make the right business decisions in the field,” said Mary Cauffman, partner, iQue Group. “This need was identified as part of a larger strategic initiative aimed at identifying and delivering growth opportunities through a better understanding of local markets, new customer types and changing brand dynamics.” The resulting Healthcare Marketplace Simulation equips the pharmaceutical company’s Managed Markets group to make better business decisions and ensure resources are allocated for maximum effectiveness and ROI, through hands-on practice in applying the concepts behind many of AstraZeneca’s local market intelligence tools. “The Healthcare Marketplace Simulation is a game-changing business acumen simulation that is part of a learning journey helping AstraZeneca Managed Markets Sales Leaders and Marketing Leaders understand how to make the best business decisions in a volatile business environment,” shared Robert Brodo, founder and executive vice president, Advantexe. It teaches advanced and sophisticated business acumen skills to professionals who are under pressure to drive revenues and margin in competitive therapeutic areas within markets that are changing rapidly and significantly. Working in teams, they set parameters for markets, influencers, and buying behaviors within strategic accounts to learn the best approach and marketing strategy to optimize profits. “By understanding the relationships between market potential and promotional effectiveness, we are helping to develop the skills needed to be successful in today’s healthcare market,” Brodo said.